LA NACION´s data journalist José Crettaz, together with data team and interactive visualization team from Lanacion.com demonstrated with DATA that the new media law was not fulfilling what it was created for, then opened dataset for everyone to reuse. In 2009 an Audiovisual Communications Law was approved that was very controversial, because many media said at the time that it was a law for controlling information and would affect freedom of speech. On the contrary, the Government administration and other sectors that supported the approval of the norm said that it would “democratize information”, generate “new voices” and “multiply voices”, among other expressions that dominated the public debate and that were presented even with TV spots. Three years after the approval of “the media law” (as it is popularly known) we tried to find out if it had created the “new voices” promised. 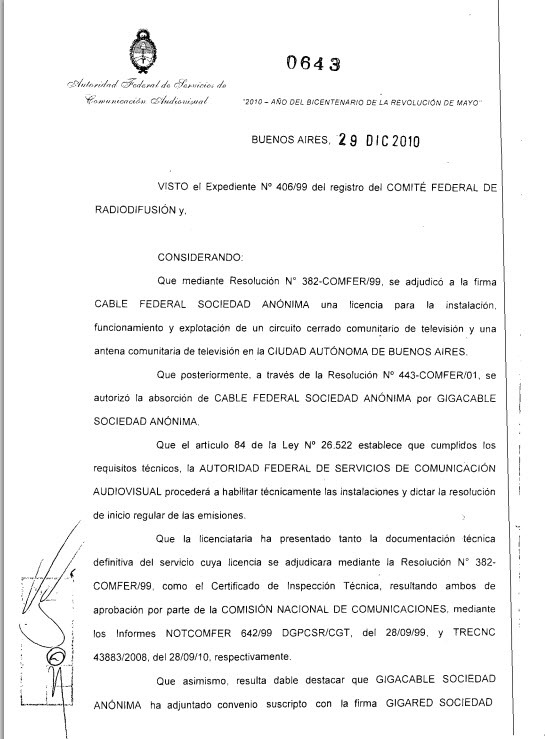 To do that, we studied, one by one, the resolutions dictated by the Audiovisual Communications Services Federal Authority (Afsca is the acronym in Spanish), the authority in charge of applying the law. Those resolutions, more than 35.100 now online, are published in chronological order on its website, where there is a summary table (with data such as the date of publication, the number of the resolution, and a reference to the type of decision adopted) and a link to the image scanned document in PDF of those dispositions . We focused on the resolutions creating new media: the resolutions awarding licenses, authorization of media and frequency awarding (in the language used by the agency, the resolutions beginning with the verbs “award” (adjudíquese), “authorize” (autorícese) and “assign” (asígnese). The award resolutions create media in the private commercial and non-commercial sectors, the authorization resolutions create media in the public state and non-state sectors (indigenous peoples, universities and Catholic Church) and the assign resolutions create media included in the text of the law (an FM for each city or county, a TV channel for each university and a TV channel for each province). So after extracting data of the resolutions, we Split and classified text in different columns. We manually designed categories and classified them in the following fields. 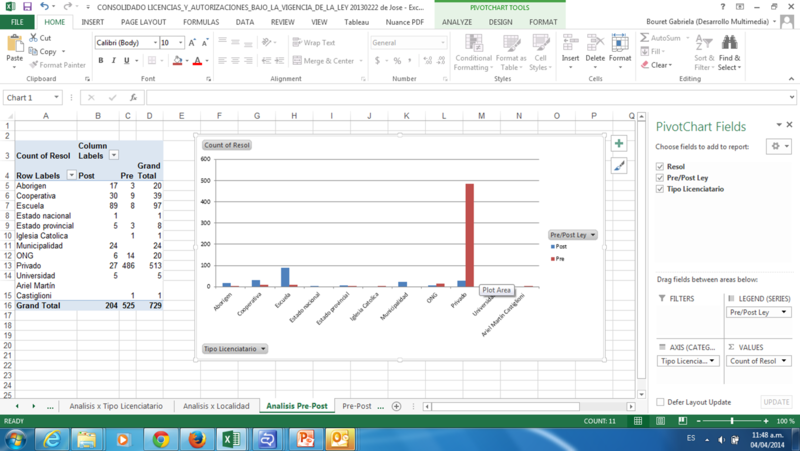 We normalized data to make different analysis as needed. 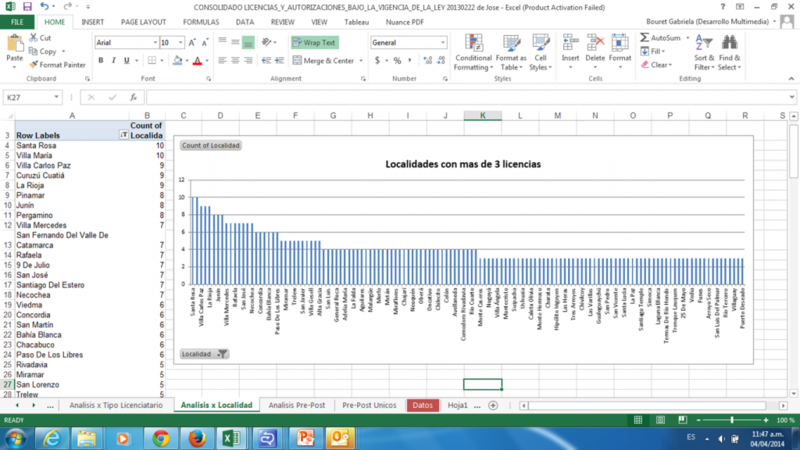 And the amount of licences granted per type of licensee..
With this information we elaborated tables to send to our interactive dataviz team so they could build the Tableau visualization. This investigation produced a harsh reply from Afsca, that was amplified through the communication media under the control of the national administration. The Afsca numbers were published, among others, in the Página 12 daily, in the following story. There Afsca said 76% of the new media belonged to the private sector, rejecting the LA NACION´s title. To adjust the numbers Afsca included in its statistics the resolutions of license awards (identifiable by the file number) the legal procedure for which had begun at the Comfer (agency that was the legal predecessor of Afsca) before October 2009. Those files recognized some legal rights obtained by the actors, for example, the licenses obtained lasted longer than those included in the new law. 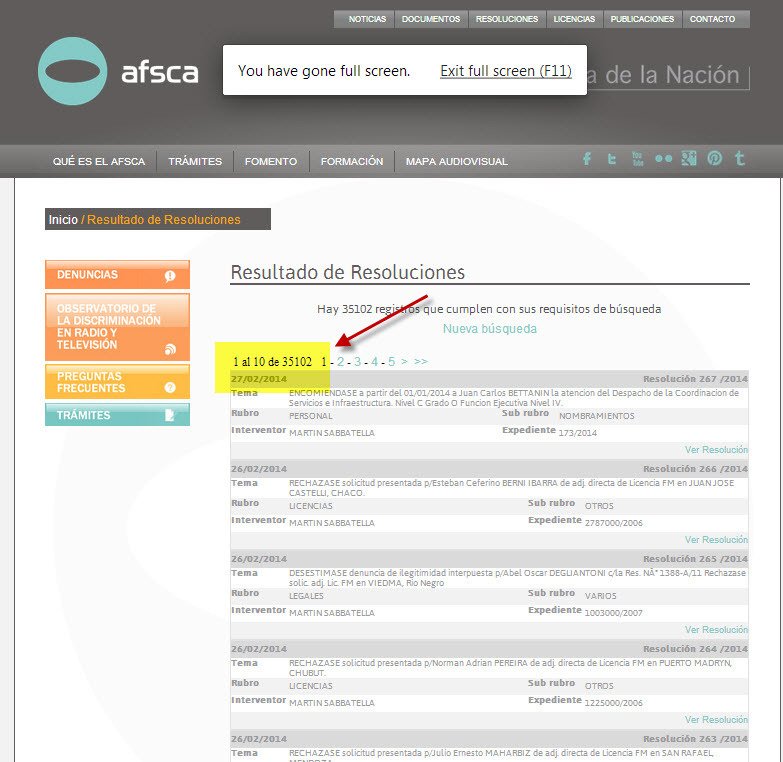 Since the object of the work was to determine the “New Voices” promoted by the new regulation, in La Nación we did not consider those files and the corresponding resolutions by Afsca. Afsca also argued that the media included in the “assign” resolutions should not be considered in the new media count because they only meant a “reservation of spectrum” for creating eventually in the future new radio or TV broadcasters. This argument, that is controversial, is rejected by specialists that say those media are already authorized by the new law and that Afsca resolutions that establish the frequencies they will be using are equal to those assigned to or that authorize media for the private and public sector. In November 2013 the NGO Chequeado (specialized in fact checking of public discourse) evaluated the two works and produced its own study. There it confirmed the numbers presented by La Nación, though omitting the frequency “assignment” resolutions. Also it studied a longer time period than the original press story. Chequeado came to the following conclusion: “Between October 2009 and the same month of 2013, 997 licenses or authorizations were awarded, of which only 283 are under the current regulation [media law of 2009]. 14% (39 of these corresponds to the private for-profit sector (individuals and firms), 13% (38) to the non-profit private sector (coops, foundations and civil associations), 55% (155) to the state-public sector (including local, provincial, and national, governments, along with schools and universities) and 18% (51) to the non-state public sector (Catholic Church and indigenous peoples)”. If the 1000 “assigned” resolutions are added to the licenses and authorizations considered by Chequeado, the percentage of state media is more than 90%. In any case, those numbers only consider the media legally authorized, which does not mean they are active. 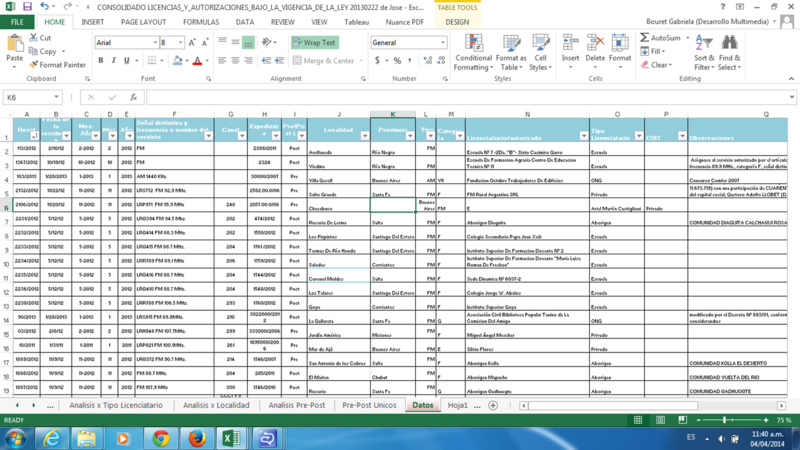 While reporting, LA NACION Opens data in two platforms: Google Spreadsheet and Junar Open Data Platform that also generates an API for programmers to connect with the datastreams. 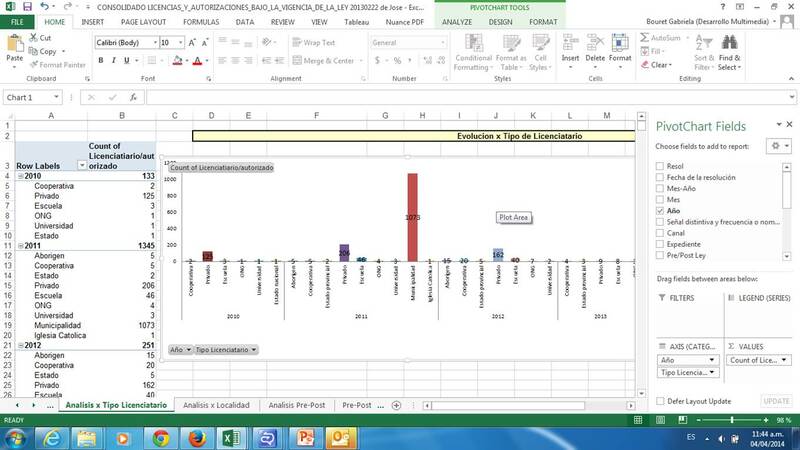 Besides, in Google spreadsheet LA NACION Data team explains the contents of the Dataset in a different sheet. A next stage in this work with data will try to determine how many of those media are effectively active. To do that it will be necessary to quantify the “authorization” resolutions (to operate all audiovisual media need an “authorization” resolution from Afsca). Esta entrada fue publicada en DATA, ENGLISH, Portfolio por abcd, y etiquetada como afsca.